While talking about the energy aware scheduler and various other aspects of the Snapdragon 810 is helpful to understand how the SoC works, ultimately we must look at performance to determine whether Qualcomm's work to differentiate their SoC was worthwhile or not. 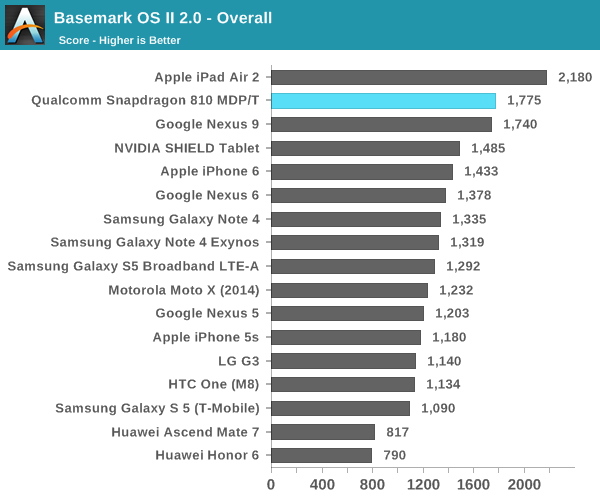 To do this, we ran Qualcomm's tablet Mobile Development Platform (MDP) through our standard suite of benchmarks, although I was unable to run benchmarks such as BaseMark X and PCMark due to odd issues with the tablet. Starting off, we have a complete breakdown of GeekBench 3 scores. The scores are closer to theoretical performance than real-world performance, but it's very useful for highlighting architectural changes. For our look at GeekBench we are comparing the 810 reference platform to our results from our recent Galaxy Note 4 Exynos review, along with results for the Snapdragon 805-based Galaxy Note 4 taken from the GeekBench database. Thanks in large part to the new cryptographical capabilities of the ARMv8 cores, Snapdragon 810 gets off to a very good start in GeekBench 3's integer benchmarks. 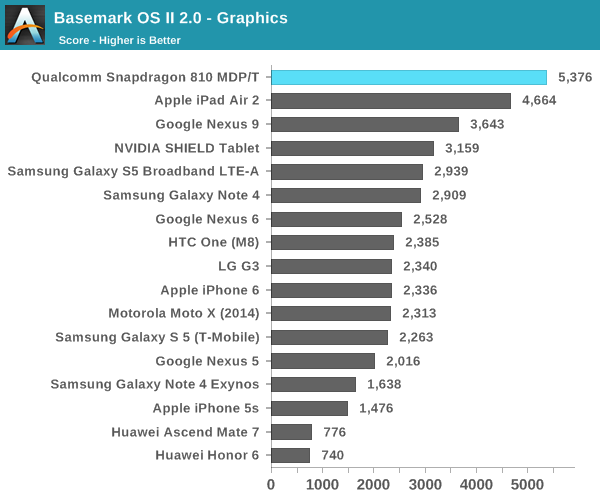 Once we move on to the rest of our benchmarks, we find that 810 continues to hold a considerable advantage through most of these benchmarks; BZip2 decompression, Lua script performance, and JPEG decompression all show considerable performance gains over the Snapdragon 805 based Galaxy Note 4. Snapdragon 810's overall performance improvement here is a rather large 45%, though if we throw out the especially large gains that come from Lua MT, the overall performance advantage is closer to 30%. There are a few cases where performance regresses however, including in PNG decompression and Dijkstra's algorithm. This could be a result of memory performance (more on that later) or architectural differences. It's worth pointing out that these cases are also among the only cases where Snapdragon 810 notably trails the Exynos 5433. 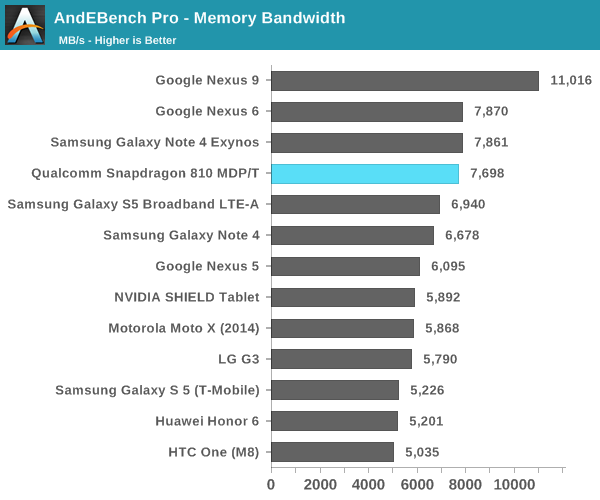 GeekBench's floating point performance shows a similar range of performance increases. More often than not multi-threaded performance gains exceed single-threaded performance gains, which is a hopeful sign for how well the Snapdragon 810 reference platform can hold up when all four big cores are being hammered. Otherwise the 810 shows considerable performance gains on almost every benchmark here, the sole exception being SGEMM performance. In this case Snapdragon 810 performance is relatively close to Exynos 5433 performance even though it has the advantage of running in AArch64 mode, which should give the FP numbers a boost over the Exynos. The SGEMM test is likely an isolated case where the Krait architecture and Snapdragon 805's high clock speed play to its favor. The overall Snapdragon 810 performance improvement is 30%, almost exactly what we saw with GeekBench integer performance as well (after throwing out Lua MT). Usually we don't like to post the GeekBench memory scores, but in this case there is an interesting phenomenon going on with the Snapdragon 810. Although the LPDDR4 memory running at 1555MHz gives the SoC a large advantage in memory bandwidth over the Exynos 5433 and runs its CCI at 787 MHz, giving the CPU port a theoretical 12.6 GB/s that's much more than the 6.6GB/s of the 5433, the actual measured bandwidth difference is much less and is nowhere near that figure in any of the sub-tests. 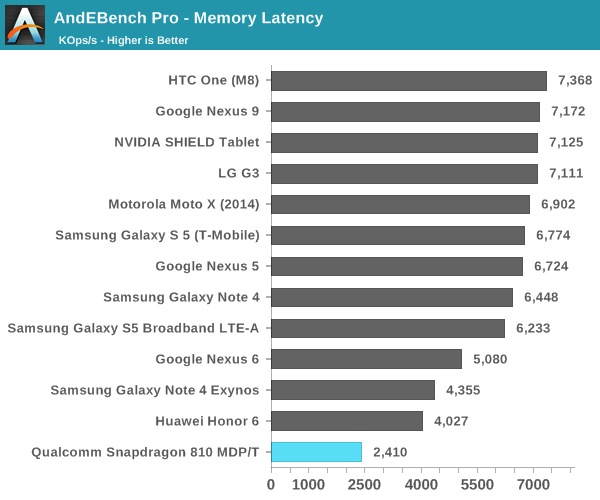 To look at this in more detail, we use AndEBench's memory benchmarks, and indeed we see a similar result. It's the memory latency test in particular that's very worrisome, as the MDP tablet achieves a very bad throughput score. We're not sure why this happens, but we hope to investigate this further in the future when we get the chance to review a shipping Snapdragon 810 device. Continuing on, let's look at our browser bench suite. Here, the Snapdragon 810 is off to quite a start. While not a direct correlation, performance in these benchmarks can generally be correlated with CPU performance. 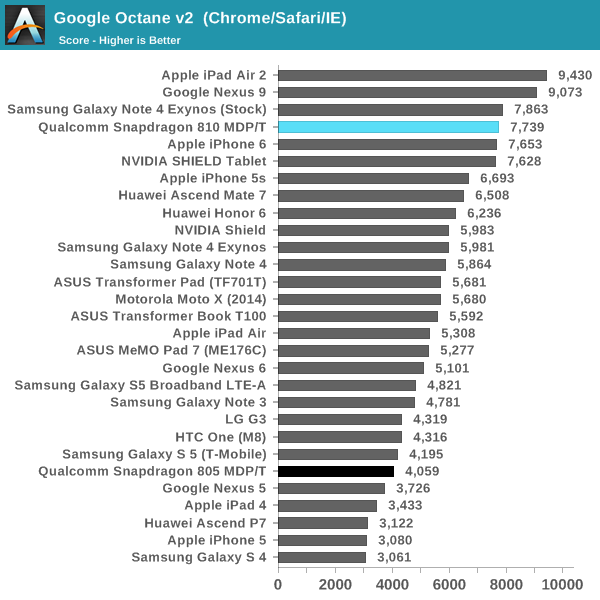 The Snapdragon 810 shines here and approaches the Nexus 9, which has a strong showing due to the underlying Denver CPU's code optimizer unrolling loops in the benchmark. In Octane, we see that the Snapdragon 810 continues to be competitive with some of the fastest SoCs available today. 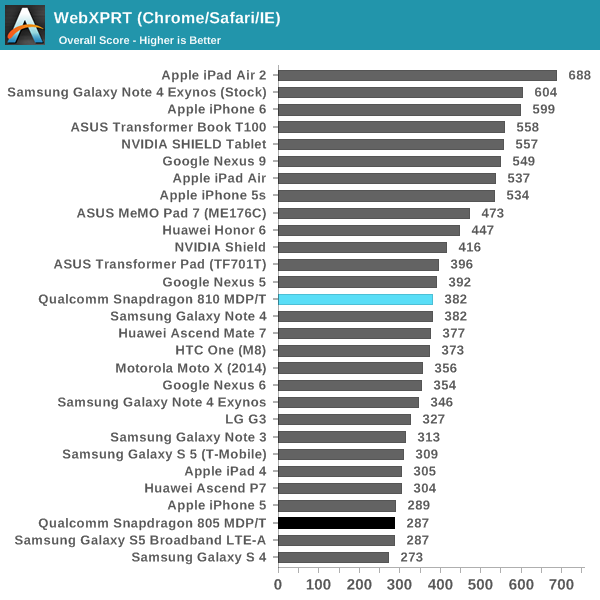 On the other hand, in WebXPRT we see that performance ends up somewhere around the level of the Snapdragon 801. It's possible that we're looking at thermal throttling or some other issue here as I was unable to run multiple trials of this test. 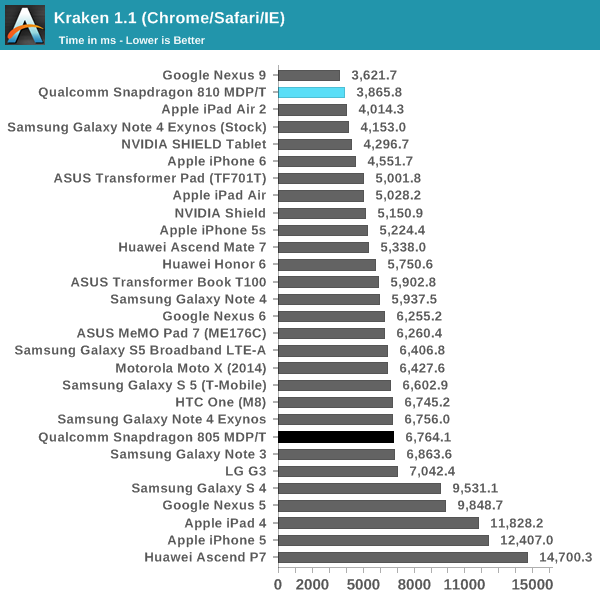 Our browser based tests are otherwise generally consistent with what we found earlier this week on the A57-based Exynos 5433, so it's unlikely we're looking at an unoptimized Chrome build. 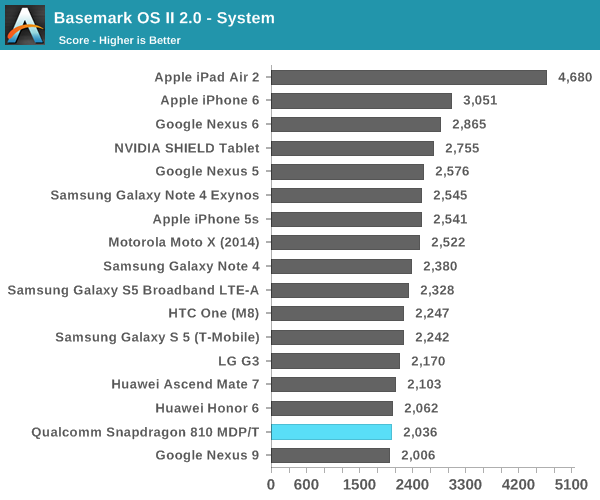 Continuing with the benchmarks we were able to perform at the performance preview, BaseMark OS II is next. The System numbers of the Snapdragon 810 MDP/T seem disappointing, as it falls at the lower end of our current flagship device lineup. It seems the reference platform isn't as well optimized as it should be. Similar to the Nexus 9, we see some odd trends in the memory tests. It isn't quite clear what's causing this, but a performant eMMC is certainly a possibility. 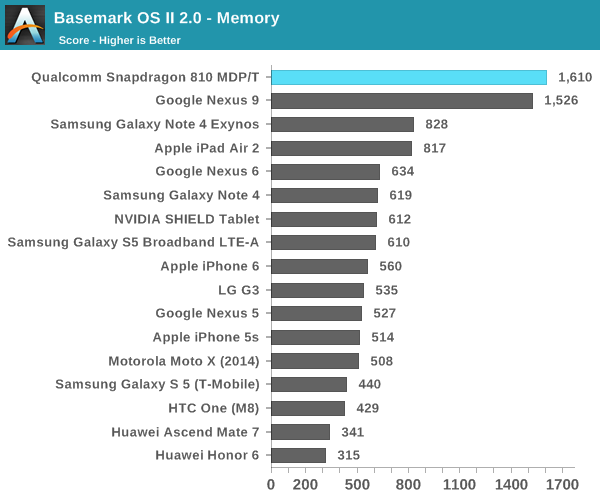 Due to this test being very device specific, we can't really judge the Snapdragon 810's performance here. As for BaseMark, what we get are very binary results with the 810 either coming in near the top or bottom. The overall score still looks quite good as a result, boosted by things such as chart-topping graphics performance. 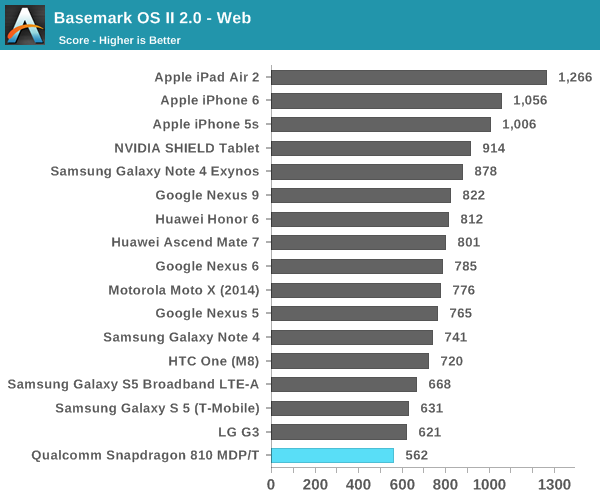 On the other hand the web and system scores are struggling, coming in 20% or more behind the Note 4 and it's A57 based Exynos 5433. Since this is an early device this may be a case of early teething issues with performance, possibly with optimizations or the OS, but at this point in time it's difficult to confirm anything. Meanwhile looking at how Qualcomm's reference platform compares to the Snapdragon 805-based Nexus 6, we find some significant performance gains at times. Though Krait has held up admirably against its A15 based competition, A57 finally provides a solid jump in performance over what even the fastest Krait can offer. "The speed on modern/flagship SoCs are phenomenal." Yes, but not this chip. It's going to be Qualcomm's main chip in 2015, it's still getting beaten by year old tech. Then again, the OEMs want a "total solution" and while Nvidia is crushing them in the GPU benchmarks, Nvidia still doesn't have a good integrated LTE solution, for example. Im with you. I wish they woul stick to standard full HD and focus on improving reflectance of outside light to a lower percentage (better performance in this area is critical it allows easier viewing in sunlight without having to crank the brightness up and use more power), Luminance per watt for either brighter screen or same brightness but less power (which is easily possible if they quit using smaller pixels that block more of the backlight), better color accuracy and gamma with even a higher bit screen to display more color while keeping accuracy high. Pre calibrated with professional tools at the factory the way dell does with their high end u3014. Almost 100% of people I know would trade a couple extra hours of battery life to have less pixels. Less pixels = less power used by gpu, lower power backlight needed, less heat from backlight generated, smaller backlight needed (can make phone a bit thinner), more responsive phone when scrolling less pixels have to be renedered for the scroll animation so it's smoother and faster and uses less energy. And there isn't really a downside. You would have to have super human eagle eyes to see this difference between 1080 RGB strip and 1440 RGB stripe. Many more benefits sticking with 1080. Anything higher is utterly ridiculous for a 5-6 inch phone.